Any takers for vintage skier or Wonder Woman? It's less than 36 hours before the Pumpkins in the Park 5K and I don't have a costume. Normally that wouldn't be a problem, but when a run is deemed Chicago's official Halloween race, and there's a costume contest for the best overall costume, the best zombie and the best dead celebrity costume, you start to feel like you should be running in something other than your basic race-day outfit. 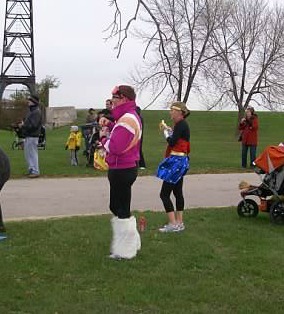 I learned that lesson last year at the Trick or Treat Trot, where I nailed the cold-runner look but it was nothing compared to the Scooby Doos, Angry Birds, chickens and more on the course. But what can you dress up as when you barely have a day to plan? And you lack costume creativity until after the holiday is over? These 34 last-minute costumes collected at Today.com helped take the guesswork out of the equation. Sort of. You see, some of the costumes would definitely be easier to run in--and pull off--than others. Which ones? Between those 34 and a few costume ideas I've received, I came up with these suggestions. Need a few more costume ideas? Check out last year's list of easy costumes you can run in. Are you dressing up for Halloween? What's your costume--and more importantly, could you run in it?